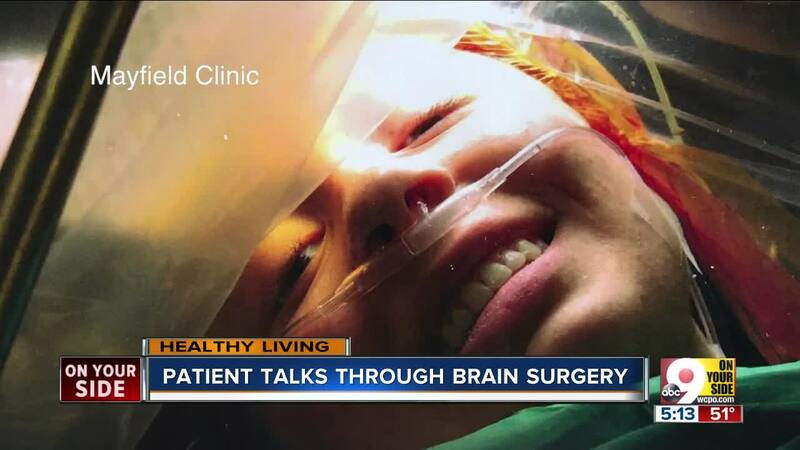 Being awake during brain surgery might sound like a nightmare at first blush, but it was necessary for Makenzi Alley's doctors to remove her brain tumor without harming her speech centers. The unique procedure at Jewish Hospital helped Makenzi make a full recovery and return to the activities she loves: Playing guitar, running and spending time with her family. CINCINNATI — Ringed by neurosurgeons in sky-blue scrubs, masks and magnifying loupes, Makenzi Alley lay on a Jewish Hospital operating table and smiled. Her brain glistened pink and purple under the electrode they used to cautiously probe it; sharper implements awaiting their turn in the procedure shone nearby. At Dr. Vincent DiNapoli's signal, Alley began to speak. The team went to work. Wide-awake brain surgery might sound like a nightmare to many, but it was the only way doctors at Jewish Hospital's Brain Tumor Center could remove the tumor that had stolen Alley's sense of taste without damaging the vital tissue nearby. "Of all the places to pick, it's kind of right in the spot you wouldn't want it to be," DiNapoli said, gesturing to a scan of Alley's brain in which the tumor stood out as a circular mass of solid white. Even a slight mistake could permanently rob her of her ability to produce spoken or written language — and, if she were fully anesthetized, her team might not know until she woke up. "I knew he needed me to talk to do his best job, so I talked the whole time," Alley said months later, laughing. "There was never a time where I was like, ‘We need to stop,' and I started freaking out. It was very smooth. Very simple." DiNapoli's team used the electrode, her scans and her ongoing conversation as mapping tools. When she stopped talking, they knew they had touched the Broca area — the region of the brain that controls speech production — and needed to proceed carefully. The tumor they removed from Alley's brain was the size of a golf ball, she said. With it went the stutter she had developed as it pressed on her speech center; in its absence, her sense of taste returned. She was also able to return to the pastimes she loves, including playing guitar, studying and running competitively. "That was actually an emotional sight to me," her mother, Traci Alley, said Thursday. She cradled her phone in her hand, displaying a picture of Alley smiling midway through a race. "She did so well. I wasn't sure I'd see her running again."